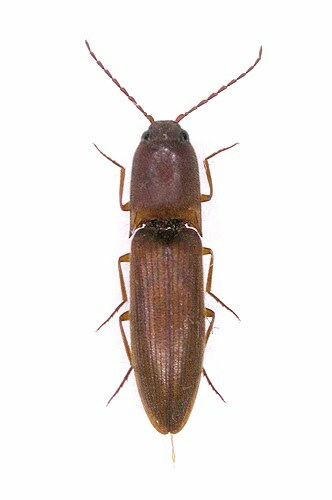 The Megapenthini are a tribe of click beetles diagnosed by having an arcuately carinate frons and the elytral apex truncate, scalloped, serrate and spinose rather than smooth and entire (Stibick 1979). Characters (from Stibick 1979): Head capsule oval, deflexed, mouthparts inferior, frontal carina complete, arcuate, bending down between antennae to meet or at least close towards labrum; antennae ll-segmented, serrate; prothorax more or less normally narrowed anteriorly, prosternal suture entire or excavated in front, double or single, surface of prosternal process more or less grooved between procoxae, procoxal cavities partly closed behind by a projection of the proepisternum, or anterior margin more or less angulate; scutellum shield-shaped, never cordate; mesocoxae open to both mesepimeron and mesepisternum; meso- and metasternum distinct, joined by a definite suture; elytral apex scalloped, truncate or at least serrate or spinose; tarsi simple; claws simple, without basal setae. [PS07] Platia, G., & R. Schimmel. 2007. Click beetles of Taiwan collected by the expeditions of the Hungarian Natural History Museum in the years 1995 to 2003 (Coleoptera: Elateridae). Annales Historico-Naturales Musei Nationalis Hungarici 99: 49-91. Stibick, J. N. L. 1979. Classification of the Elateridae (Coleoptera). Relationships and classification of the subfamilies and tribes. Pacific Insects 20 (2-3): 145-186.